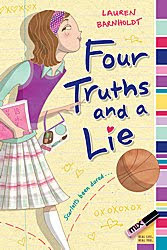 Four Truths and a Lie by Lauren Barnholdt, is a story about an eigth grade girl named Scarlett Northon. She has just transfered to an all girls school where she will be living for the time being.Her room mate is snotty miss Crissa know-it-all with her popularity and cool life. Her ONLY best friend is Amber and she was forced to be on the school basketball team But the only reason she had to transfer from her beautiful life, school, and friends was because of the secret. Yeah, we're talking big-time secret, like, no one can possibly EVER know under ANY circumstances. One day in language arts, her teacher assigns everyone a penpal from the other school for boys. Her penpal is number seventeen and her first letter from him is a normal welcome letter. It's the second letter that gets a little crazy. The first sentence is Welcome to Four Truths and a Lie. Just from this one letter takes Scarlett from a new girl to a possibly expelled girl. How will things turn out? I got this book for my book club at school and I thought it was going to be one of those bratty girl goes to boarding school type dramas. But when I started reading it, it actually took me by surprise. Scarlett isn't really a brat and she moves not because of being a brat with no manners but a girl with a secret that happens to have ruined her life sociably and acedemically. I didn't mind Scarlett's personaality but it was like she knew every brand and every latest shoe or whatever. But I still enjoyed the book. Give it a try. You may never know, it just might surprise you like it did with me.